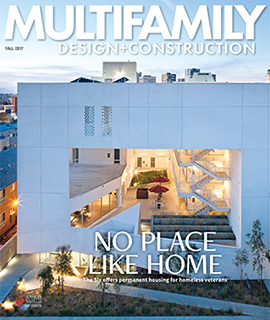 Multifamily Design+Construction has the largest circulation of any publication in the apartment and condominium field — 45,002* architects, designers, builders, and specifiers. Every issue is packed with eye-appealing content and valuable technical information on the most innovative project designs, the latest building products and technologies, and the hottest trends and innovations in the apartment/condominium market. If “multifamily” is in your sweet spot, Multifamily Design+Construction is the marketing vehicle for you.